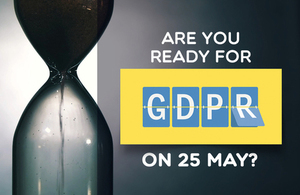 Will you be ready for GDPR before 25 May? Data protection regulation is set to change on 25 May this year as part of new General Data Protection Regulation (GDPR) laws, which could affect how organisations and businesses collect, use and store people’s personal data. Your customers, employees and other individuals need to be able to trust you to look after and use their personal data responsibly and safely. Knowing they can trust you is good for your organisation or business and you may risk a fine if you don’t comply. Your professional association or trade body can also provide advice.